Good. Some shelf wear Buy with confidence-Satisfaction Guaranteed! Satisfaction 100% guaranteed. Very Good. Very Good condition. Audio CD. Case Good. Booklet Very Good. 2 disc set. Case cracked/scuffed. Quality guaranteed! In original artwork/packaging unless otherwise noted. Franz Liszt; Modest Mussorgsky; Wolfgang Amadeus Mozart. Very Good. In very good packaging. 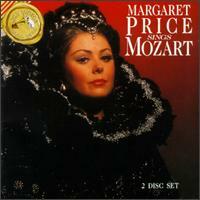 Margaret Price Sings Mozart.